Splatoon 2 has been in Switch owners’ hands for almost a full week, as squeaky-clean newcomers and grizzled ink veterans alike have been tearing through countless turf wars. While the battles rage on, we wanted to chat with some top-level players to get their assessment of the sequel: What’s the best tool for inking? What’s been the best improvement, and what does the game still need? For US Splatoon squad Deadbeat, the game fixes up a lot of issues from the first game. Gregory “Giraffe Tamer” Papi, one of the players for Deadbeat, says that unlike the first game, the sequel feels more team-based than reliant on individual skill. There are less individual player specials like the Kraken, and instead more team-based ones, like the Tentamissiles or Ink Armor. Angela “Bickibird” Scott, an Australian player for Blue-Ringed Octolings or BRO, notes that the changes to special have up-ended the school of Splatoon thought. A revamp of skills and abilities have changed the pace of the game as well. Sendou, a top-tier European Splatoon player notes that nerfs to gear abilities like Quick Respawn and Stealth Jump have slowed down the back-and-forth of the game, forcing players to be more careful. Several weapons came up in discussion among the pros. The Tentatek Splattershot is an old standard, a jack-of-all-trades that will likely always see use. Chargers, however, have seen reduced popularity. For many weapons, it depends on what the mode calls for. While the Aerospray may be solid choice in a Turf War situation where you need to spread ink by the mile, it has a tough time actually finishing off enemies compared to other weapons, making it less suited for modes like Splat Zone. Though regular matchmaking is all Turf War and inking the most map, ranked and competitive play focuses on objectives, with gametypes like the payload-based Tower Control, king-of-the-hill Splat Zone and capture-the-weapon Rainmaker. Sendou sent me a picture of the top squads in a given league mode period, saying it shows a clear trend of popularity. While Nintendo has been patching the game (one even went out last night, upping the special requirements for weapons like the Tri-Slosher), some still reign supreme. The prevalence of ink armor and less range on maps has made the charger less potent than in the first game, but some players are still working on strategies for it. Octolings’ Marianne “Latias” Hade suggests changing up your playstyle, sniping from behind walls rather than zipping around outside cover like you might in the first game. All players had advice for newcomers looking to grow in Splatoon, and top of the list was motion controls. Every player agreed that using the motion controls was best, and that every top player uses it. Getting into the mindset is also important, as Deadbeat’s Whitt mentions. Splatoon isn’t just a shooter, but an objective game, one focused around holding territory as much as it is splats. Henderson expands on that idea, suggesting players find a role that suits them. Not every inkling has to be tallying up double-digits in splats. 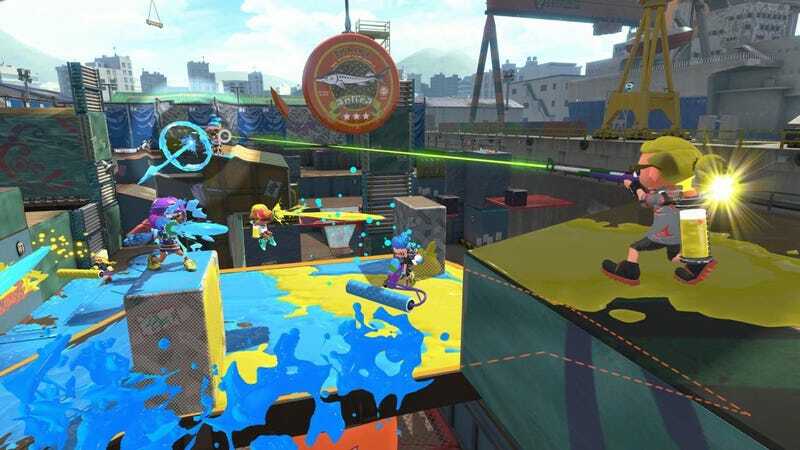 Though many rough spots have been smoothed over, there’s still some issues that top-level players of Splatoon are struggling with in the sequel. Regional matchmaking has fixed overall latency and reduced lag, but it also means that many teams have trouble practicing against other regions. Though regional matchmaking has caused some hiccups, the addition of modes like league battle adds more tools for competitive-minded players. Many players believe that options like built-in LAN play and spectator mode will help bolster the competitive audience. Splatoon 1 had to deal with a restrictive set of modes and limitations, compounded by the quirks of the Wii U. The lack of an actual spectator mode also meant plugging in capture cards for all the Wii Us, swapping between one player’s POV to another or simply watching through one station for the whole match. New tools don’t just make it easier to play competitively, but to compete just about anywhere. Players mention battling in not just tournaments, but at others’ houses and parks, and the booming popularity of the Switch certainly helps raise interest in the game overall. What will likely keep these Splatoon players going is a sense of community. Discord hubs and Twitter followings kept the original alive long after patches stopped rolling out, and as advice for new players looking to get their feet wet in the competitive scene, they all encouraged people to get involved in their scenes. Pros like Sendou note the usefulness of having a team, while Octolings’ note the value of having a support system behind you, to help you grow and improve. Splatoon isn’t just about K/D/A—it’s a team game through and through, and if you want to up your game, the best way to do so is find some like-minded squids and hit up matchmaking.